Register Now for the Summer Arch Program! The 2019 Summer Arch Program will begin on Tuesday, June 25th from 6-7 PM. The program will run for 6 weeks until Tuesday, July 30th. Eligible players are those born in 2006-2012 (U8-U14). The classes will be divided into U8, U10, U12, and U14. Registration will open April 1st and the fee for the Arch program this Summer will be $89. If you have any immediate questions, please direct them to Celtic Director of Soccer Operations, JJ Ruane. Jen Jeschke will be leading the Arch Program. This is Jen's second year with Palatine Celtic. She has a USSF D license. 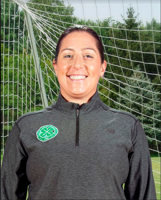 She also works with our U8B Academy and U9 Boys in the travel program. She is also the head of the Mini Celtic program here in Palatine. Contact Coach Jen if you will be missing training or a game. What is the Arch Program? The Arch Program began in Fall 2017. The thought behind the Arch program was to provide a program that utilized professional training just like the travel program for all players from U8-U12 (U14 being offered in Fall 2018). It is a supplemental training program for our all players that want professional training to improve their soccer skills. All sessions are run by a Palatine Celtic staff member who are licensed by the US Soccer Federation or the United Soccer Coaches Association. Our program is patterned after the same philosophy as our Celtic travel program who has produced some top players in the area. Our program will focus on passing, receiving, shooting, and dribbling. These skills are the foundation of soccer and the Arch program will make you a better soccer player. The Arch program is divided into seasons. Questions regarding the Arch Program can be directed to JJ Ruane, Director of Soccer Operations.